Unfortunately there is no standard of quality set, no special qualifications, no certification, training or special licensing required to be a detailer. Anyone with a buffer and vacuum can call themselves a detailer. Training, product knowledge and quality standards are up to each individual business owner. automobiles. His father Ferd, his four older brothers and one brother-in-law instilled a passion for cars and the proper care of them. 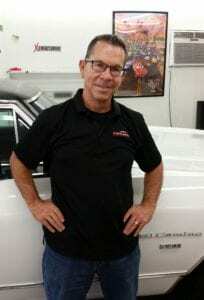 He moved to California in 1981 to work for his oldest brother Doug in his auto repair business and did some detailing on the side for extra money. With the expert training of Jim Hunt (now deceased), and a lack of passion for broken knuckles, he left mechanics and opened his first shop. It was very successful, but after two years, he decided to move back to his Colorado home. He spent two years following his other love, music, at Colorado University in Boulder College Of Music, while detailing for a dealership their part time and during the summers. Still having a love for more contemporary music and continuing to play in bands, he found classical music not to be exactly what he was interested in, so he pursued the detail industry again. A Auto Detail was born in 1990 in a two car garage out of his home in Arvada. As business grew, he was forced to move out of that area because of the zoning. So working out of a friends auto repair shop, and after about a two year search, in 1999 he moved to his present location at 2835 W 90th Place in Denver where it was zoned for his type of business. It has been Marks intention all along to provide the kind of service he'd want to be done on his cars. So keeping it as a small, affordable, retail only business has allowed him to do that. He feels that other shops that have large commercial and dealership accounts tend to put the retail customer 2nd because of the demanding nature of big accounts. The same with the big Carwash/Oil and Lubes where detailing comes 2nd. Although not the most profitable way to do it, he can give each vehicle the personal attention he feels you deserve. At A Auto Detail Service, Owner Mark Mueller, a.k.a. "The Buff Specialist" is a Master Detailer and expert craftsman, with 38+ years of professional experience. He has trained with, studied and worked under some of the top craftsmen in the country. He attends, as well as has taught training seminars and continually studies video and classroom trainings and certification programs. Mark has received certification from 3M, Perfect IT, Trizac & PRO. He is a Ceramic Pro and SB3 certified installer, which are state of the art permanent nanoceramic paint coating systems. He attends product trade shows and works closely with his suppliers to stay on top of the latest technologies in car care products for your vehicle. Mark was the focus of the feature article in the January 2004 issue of Auto Laundry News, the second largest Carwash and Detail trade magazine in the world. He also attended International Car Care Conventions and follows the guidelines of the ICA (International Carwash Association) , IDA (International Detail Association) and the PADA (Professional Auto Detail Association). He has done cars for every major car show in the state including The Denver Auto Show and The Tri-State Auto Show. Mark either does or oversees every aspect of the shop many services, all of which are Satisfaction Guaranteed. We also have a A+rating with the Better Business Bureau. Auto Detail Service has never had a complaint in over 25 years of business! compared with A Auto Custom Detail, A-1, AAA or any other detailing service in the Metro area! In Fact, approximately 10-15% of our business is fixing the mistakes of other shops! Our prices may be slightly higher than some dealerships or other shops in the area, BUT, we offer a far superior service! " My staff is not comprised of a bunch of minimum wage help that is doing this for the first time in their life and/or are simply pulled off the Carwash line, handed a buffer and told to detail your car. I do all the work myself and if I hire or subcontract someone, I personally train them and pay them accordingly so they can take pride in their work. I know what we're worth and undercut it by more than 30% to fight for your business." Please compare our prices and services to other "Top Quality" shops, Not a Carwash, in the Metro area. There are only a few shops that can compete with our quality standards.